Your instructor, Alan, is shown above after receiving The Marquetry Society’s highest honor, the Silver Rosebowl Cup, at the 2015 International Marquetry Exhibition. The event was held at Ingatestone Hall in Essex, a 16th-century manor house near Chelmsford. 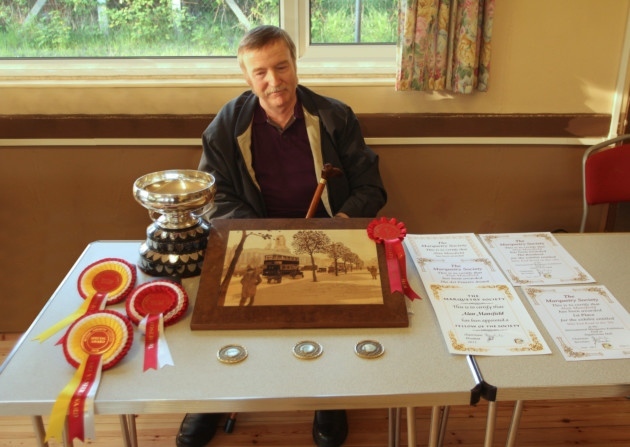 Alan received the award for the photorealistic piece shown, which is entitled Mile End Road in the '30s. That piece was also named first overall in the exhibition, and Alan was made a fellow of the Marquetry Society and received the President’s Commendation Award for his work. You may have seen plenty of examples of marquetry, which traditionally have taken the form of floral or geometric designs on old furniture. Over the last few decades, however, there has been a change of direction in the art's applications. Marquetry, the manipulation of cut and shaped wood veneers applied to a surface, has traditionally been used to depict a picture or design adorning furniture. For a long time, it wasn't seen as anything more than decoration. Indeed, it still performs that function today. But over the last few decades it has begun to evolve into a distinct art form. Marquetry, by the very nature of the materials being used, has a built-in advantage that most other art forms strive to achieve, and that is texture. The veneers we use are brimming with natural grain patterns and light effects that change with the orientation of the veneer. If fine artists were able to obtain paints to replicate the effects that our marquetry materials exude naturally, they would (I suspect) quite willingly pay a king's ransom for them. Grain patterns and light effects are not the only advantages with our materials. There are also naturally occurring faults in the veneers that we marquetarians cherish. These faults, supplied by Mother Nature, often provide ready-made picture elements that would be impossible to achieve any other way. Marquetarians like to say "Let the wood do the work" wherever possible. 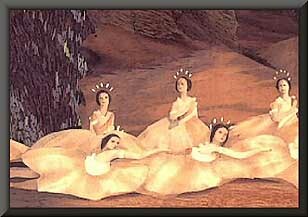 To illustrate this point, I'd like to draw your attention to the tutus (skirts) of the dancers in the detail illustration at right (from Valse des flaco). The veneer used here is willow, and the natural quilting effect of the veneer gives a shape and form that paint would find very difficult to replicate. Unfortunately, marquetry is an art discipline that's still very much in its infancy when compared to traditional mediums. In most instances, it still attempts to replicate existing art. Marquetry has yet to gain the confidence to become a new and unique art medium in its own right. But that day is coming, and original works are now being produced. Alas, they are few in number and still somewhat grouped in with the "copyists" label that is often attached to marquetry. I feel that the breakthrough will occur when art schools and colleges begin to recognize and teach marquetry as a new art. Then we will start to see marquetry pictures hanging alongside oil and water color paintings in art galleries and boardrooms.That time, I think, isn't so far away. In this series, I hope to guide you through some of the basic (and a few of the advanced) techniques of marquetry, where we woodworkers become artists in our own right. The content of the following set of how-to articles is copyrighted by the author. 1. Afara - a nice light gold, well-figured veneer. 2. Australian silky oak - it has a wonderful dotted grain pattern. 3. Avodire - light golden with a lustrous sheen, good for skies & water. 4. Ash - light yellow with very useful figuring. 5. Birch - a pink/cream colored close grained veneer with a smooth grain pattern. 6. Bird's-eye Maple - pink with small regular nodules. Extremely useful. 7. Castello - golden, with a very useful darker figuring. 8. Cedar of Lebanon - orange/yellow - useful in landscapes. 9. Chestnut sweet - has a long, flowing, figure. 10. Koto - clean, white, virtually flawless veneer. 11. Lacewood - red/pink to orange/tan in color, with a uniform mottled effect. 12. Magnolia - often has a natural greenish look to it. 13. Mahogany, Honduras - deep orange/brown close grain. 14. Mansonia - gray/brown with a useful figuring. 15. Olive ash - light creamy gold with strong gradated figuring. 16. Peartree - regular pink/brown, smooth-grained, easy-cutting veneer. 17. Primavera - light gold - could be used for a summer sky. 18. Rosewood, Santos - brown, with strong, dark figuring. 19. Sapele (Mahogany) - very useful for cross-banding on borders. Striped effect. 20. Sycamore - light colored - takes sand-scorching well. 21. Walnut American - dark gray/brown, with good figure. 22. Walnut European - a lighter version of American walnut. 23. Walnut Yew - golden/brown (can be yellow), with a very useful random knot pattern. 24. Zebrano - a very prominent striped grain, like lines on paper. This list has only been 24 veneers long, but I think it will give you a good starting point from which to begin your marquetry career. There are roughly about three hundred veneers available commercially these days, but you don't have to hurry out and purchase all of these at one go. You can add to your stock gradually. As long as you have the most versatile ones (such as those mentioned above) you will be ready to start making marquetry pictures. Uunless you're going to make marquetry pictures on a really grand scale, you won't need "full leaf" veneers. Small sections will do fine. Generally, marquetry pictures are less than 18x24". Some are even as small as 4x3". 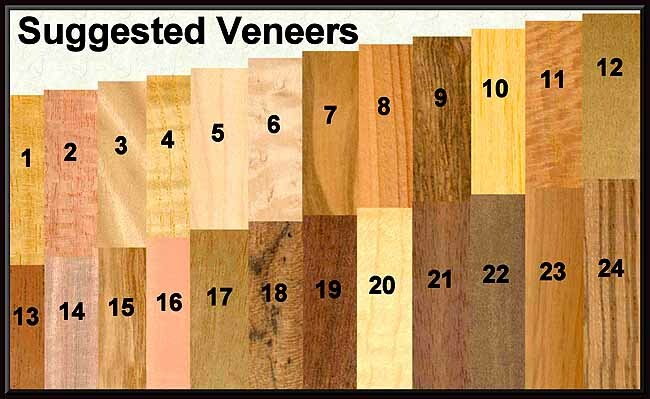 Often, the dimensions are dictated by the maximum picture size that your veneer press will hold. If you have access to an industrial-sized press, then the world is your oyster as far as picture size is concerned. If you get a chance to look over the veneers before you purchase them, try to choose a few that give a good impression of sky. You will find these invaluable. It's also a good idea to try and obtain some veneers with wild and exaggerated grain patterns (figure). What cabinetmakers might class as faults and blemishes are often perfect for marquetry. In the next article in this series I will explain the tools and equipment that are required to perform the art of marquetry. In successive articles, we will investigate the basic techniques and the manipulation of grain patterns and veneer textures. And if you'd like to see larger images of the veneers we have described (and many more), there is a reference library of actual veneer scans on the Redbridge Marquetry Group's Web site. We would be delighted to have you visit us online. Thanks for your interest in marquetry.